Canada – one of the world’s wealthiest countries – boasts of the 14th largest economy in the globe. To maintain its GDP growth rate of 2% every year, the nation needs the best minds to run its many companies and corporations. Of course, the finest businessmen can only come from one of the best colleges for business in Ontario: Humber College. True to its slogan “More for You,” it can give you the knowledge and skills that can help you succeed amidst Canada’s challenging business panorama. Established in 1967, Humber College is a relatively young institution nestled in the beautiful city of Toronto, Ontario. Presently Canada’s biggest “Community College,” it is the home of 10,000 full-time learners and 100,000 part-time students. Humber College plays home to eight academic schools, one of which is the Business School. Business diplomas, degrees and post-graduates certificates can be obtained at any of the two campuses in Lakeshore and North. Why Study at Humber College? At the Business School, you can pursue whatever track you wish to take. After all, the college offers 25 business programs stemming from over a dozen fields. International Business, International Development, Marketing, Marketing Management, Paralegal Studies and Supply Chain Management, to name a few. If you are still not decided with the track you wish to pursue, then Humber College is perfect for you. That’s because the school offers a common two-year platform, where students are given the opportunity to decide on the specialization they wish to secure. At the start of junior year, the learner can engage in any of the 10 great bachelor degrees offered by the college. In this modern day and age, new hardware and software are being utilized by business practitioners throughout the country. Humber manages to keep abreast with these innovations with its leading-edge programs. At Humber, students can manipulate sophisticated programs and devices – the likes of which can prove handy once they enter the workforce. More than just advising, industry partners create a major impact on the student’s learning experience and future choices. With Humber College’s strong industry partnership, its learners are better prepared for the workings of the industry. It goes without saying that experience is vital for every student – as it can get them the employment he has been eyeing on. 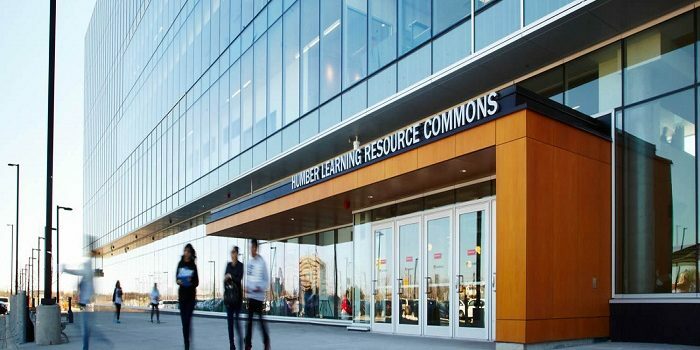 To give its learners the competitive edge, Humber College offers co-op programs. Humber’s co-op programs are truly beneficial, as they provide the student with relevant work experience. They enable the learner to apply the knowledge he has obtained, apart from giving him a good idea of the job that suits him best. It also proffers financial gains – and provides the student the chance to network with industry leaders. While Canada might be a hub of great business opportunities, you might find yourself gearing for international business operations. If this is the case, then Humber College is the perfect school for you. After all, the institution offers a semester abroad opportunity to its students. In this program, students can head to Japan, New Zealand, Finland or Scotland – where they can learn business education from a global perspective. What’s great about Humber is that it continues to guide you even after you graduate. After all, the Business School provides great work placement opportunities to its students. With its job postings, job search tips and employer profiles, Humber graduates can take hold of great employment opportunities. There’s an old saying that goes “It’s not what you know, it is who you know.” Although Humber College Business students are equipped with exceptional knowledge and skill, it is essential that they interact with the leaders of the industry. To make this possible, the school arranges networking events, where students can learn and network with the country’s best businessmen. Do you have a part-time job? Have you just given birth? Whatever event might stop you from continuing Business School, you do not have to worry about it if you are enrolled in Humber. That’s because the Business School offers online courses. Although placed in a virtual classroom, an online course invokes the traditional school setting – with a teacher, classmates, assignments, deadlines and tests. If you want to learn at home – or on the go – then make sure to study at Humber. Most people believe that they have to spend a lot in order to learn a lot. But with Humber, it is not the case. In fact, this distinguished college has one of the lowest tuition fees in the region for locals at about $3,800 per year. It is cheaper (but not necessarily lesser) than other Ontario institutions, which average at about $5,500 annually. “A great place to learn,” This is the usual thing you can hear from Humber College’s Business students. After all, the school is known for its beautiful and positive learning environment. Apart from excellent knowledge, the school also imbibes in its students the needed technical skills for a life outside of the college. When it comes to business education in Ontario, one of the best schools to enroll in is Humber College. Although it is small in scale, it offers a diverse array of programs – the ones you will see in bigger, more expensive institutions. Outside of its core curriculum, the school also provides its students with the appropriate experience that they need with its co-op programs. Apart from giving the learners the chance to apply the knowledge they have learned, co-op programs also provide the students with financial rewards. More than that, Humber helps its students transition from school to employment with its work placement opportunities. Its’ networking opportunities, job openings and work search tips ensure that learners obtain employment right out of college. Diversity, experience and work assistance – these are just some of the things that you can expect with Humber’s Business School. With that being said, there is no reason why you should not gear up for the prestigious Humber College. 2. What is the difference between University and College in Canada? I really enjoyed this article, I go to Humber now and it was definitely a great decision for me.